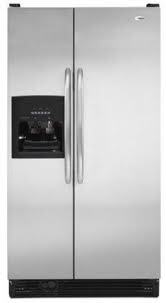 There are a few great Amana Side by Side Refrigerators that we felt compelled to tell you about. Luckily, Amana continued developing high quality refrigerators and refrigerator freezers for decades and today stands as a leader in high quality, affordable, refrigerator products. But only a handful of those models made our cut into the top TWO. Although Amana was acquired by Maytag in 2001, they have now been folded into Whirlpool as the Whirlpool Corporation acquired the Maytag brand in 2006. Amana's mark of quality has remained intact as Whirlpool is certainly a brand that has its own reputation to uphold. There were only a few side by side refrigerators in the line to begin with which leads to why so few are being highlighted. Remember that even though there are two models listed below, each one comes in various finishes. So, here are the top two Amana Side by Side Refrigerator models that we recommend from Amana. 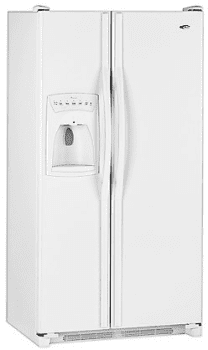 We recommend reading the full reviews to really get an idea about these refrigerators. OVERVIEW: The Amana ACD2234HRW did an excellent job keeping a constant temperature. It has a lot of nice features for the price range as well, but we were somewhat surprised by the lack of a few things that you would expect to see in a side by side refrigerator. The fact that it has two veggie crispers but no meat drawer seemed a bit odd. A can rack seemed to be one feature that would greatly enhance what is already a well designed interior space. But, those faults aside, it ran quietly and proved to be one of the better Amana models. Click to Read the Full Review. OVERVIEW: The Amana ASD2522W was by far one of the best side by side refrigerator models we have covered in this price range. It has an attractive design, it holds temperature efficiently and effectively and it comes with a wealth of features that make this model a true standout in the Amana line. Best of all it comes in black, white, silver or stainless steel -- a finish for any kitchen. Click to read the Full Review.